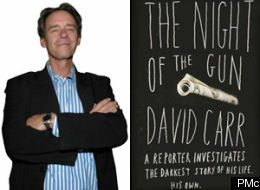 Anyone who’s familiar with the Times media critic is probably familiar with the fact that he wrote a most excellent addiction memoir, The Night of the Gun (available for purchase over on findingtheafterparty). And perhaps many who are familiar with that memoir remember the incredibly chilling, in every way possible, tale about his going to buy cocaine during a cold Minnesota winter while his two infant twin daughters were tucked into the back seat of his car. But perhaps not all of these people know that Carr also told this story on the Moth main stage in 2007 as a part of their “Late Late Show: Stories of Life After Dark” theme night. I didn’t until heard it on the radio this morning, as part of NPR’s Moth hour. And now I just found it online for you guys. Because it’s that good. Enjoy—and marvel at the fact that these infants not only survived but are thriving well enough to be making moves in media circles.